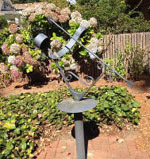 Work to design and make the Analemmatic Sundial was done by students of the sixth grade science class and teacher Eric Newell in 2005. The central walkway uses stepping stones sandblasted with the name of the months. John Westenskow's ceramics classes at Mount Logan Middle School made the time stones. Students surveyed and plotted the location of the stones and provided the physical labor to dig holes and pour cement. This is an octagonal-shaped horizontal dial 240 mm (9.5 inches)across. The photo-etched plate has a central compass rose and delineated with a half hour circle and second circle dividing the time into quarter-hour increments. Roman numerals mark the hours from 6am to 6pm, with an extra hour mark to extend the dial's time-telling from 5am to 7pm. The dial is adjusted for the longitude of the site. Atop the dial face is a sturdy filigree gnomon approximately 5mm wide and 90mm (3.5 inches) high. South of the gnomon is a graphic Equation of Time. This concrete analemmatic dial is set is a larger concrete plaza located in a City park with an overall theme of Sonoran Desert environmental education and nature-based play. A 22 by 17 foot analemmatic dial of stained concrete with Arabic hour numerals of polished brass. The dial perimeter and hour numerals are set in a blue decorative polymer "U" arc, appearing as a large mule shoe that represents the university Muleriders mascot symbol. Dial colors represent the royal blue and gold school colors. A vertical dial on a 15 x 40 foot section of a second story brick wall declining 11° east. The gnomon, hour lines and 7 am to 4 pm Arabic hour numerals are aluminum. A vertical dial, perhaps one foot square, above the front door of the Georgetown University Astronomical Observatory (the Hayden Observatory). The dial face has Roman hour numerals near its perimeter. A 15 foot diameter horizontal dial with 5 foot high welded stainless steel plate gnomon. 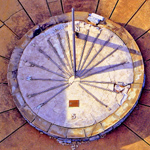 The dial face is elevated 18 inches by a white marble-faced platform above a 50 foot diameter concrete plaza that includes inset stainless steel hour line extensions. The dial face is rimmed with Bluestone and has elevated stainless steel hour lines for 4 am to 8 pm and elevated three inch stainless steel Arabic hour numerals. Cardinal directions are marked with elevated 6 inch stainless steel letters. A very large bowstring equatorial dial. The outer diameter of the equatorial ring is 26 feet, the height of the meridian ring is 22 feet above the base and the gnomon rod is 26.5 feet long, making this possibly the largest bowstring dial known at this time. The equatorial ring is marked on two faces with large Roman hour numerals for 7 AM to 5 PM. The dial base includes a large compass rose marked with major directions. An incorrectly installed but prominently displayed 8 inch bronze horizontal dial with hour, half-hour and quarter-hour lines and Roman hour numerals from 5 AM to 7 PM. The bronze gnomon is inclined from the dial face approximately 42° and the hour lines appear correct for that latitude, though the local latitude is about 39°. A south facing vertical dial placed above a window high on a wall of a high school. The dial face includes hour lines and Arabic hour numerals 6 AM to 6 PM. The dial is a separate plate affixed to the wall. The dial may be viewed from College Street side of the building. A south facing vertical dial on a chamfered triangular pillar. The gnomon is slightly bent. The dial face includes hour lines with Arabic numerals for Pacific Standard Time and PDT, the approximate coordinates and the magnetic declination. A 16 by 20 foot, two-tone concrete analemmatic dial with 7 AM to 8 PM Arabic hour numerals on 12 inch round stamped concrete disks. Instructional and use information is shown on impressed lettering colored concrete plates. A large vertical dial on the southwest brick wall of a private home. The hour lines are square PVC stock. Arabic hour numerals for noon to 7 PM are brass plated figures mounted on brass plaques. The dial declines 54 degrees from south to west. The ends of the hour lines indicate the solstices except for several long summer hour lines. The equinoctial points are marked by red glass inserts on the hour lines. A wrought iron equatorial dial with an arrow rod gnomon. Equatorial band and support have iron scroll work depicting a bow and arrow. Dial is painted and hour numerals are obscured. An east-declining vertical dial near the top of a stone winter residence building, now a museum. Dial face includes hour lines and Roman hour numerals for 5 AM to 3 PM. Building and dial were built in the early 1900s but gnomon appears to be in good condition without corrosion so it may be bronze. Dial includes a depiction of a scroll with engraved Latin inscription.